“The Ghetto Fights,” by Marek Edelman, was published in a pamphlet called The Warsaw Ghetto: The 45th Anniversary of the Uprising by Interpress Publishers. Hard-to-find document I’ve made available through my Holocaust site. 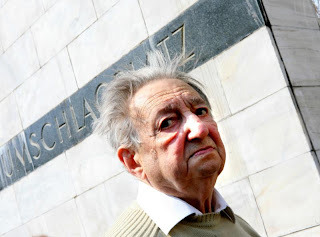 Marek Edelman (born December 31, 1922) is a Polish political and social activist, cardiologist, and last living leader of the Warsaw Ghetto Uprising of 1943. For more, go here.